Script editor Terrance Dicks was determined to prove that the box Doctor Who was in could be broken. With The Time Lords having disabled the TARDIS from being able to leave Earth, there could be only two types of stories: alien invasion or mad scientist. Dicks came up with a novel approach: the aliens were already on Earth. From that, screenwriter Malcolm Hulke created Doctor Who & The Silurians. This story is the only Doctor Who story to have the words 'Doctor Who' as part of the title (not counting Episode 5 of The Chase, titled The Death of Doctor Who). Why the words 'Doctor Who' were included is lost in the fog of history (more than likely an error), but in the seven episodes of The Silurians (which is how I'll refer to it from this point for ease), Hulke not only created a unique monster but touched on important topics of the day couched in entertainment. The Doctor (Jon Pertwee), now basically stuck on Earth, is the scientific adviser to UNIT (the United Nations International Taskforce, now the UNified Intelligence Taskforce), which is under the command of Brigadier Alistair Lethbridge-Stewart (Nicholas Courtney). The Brigadier has been investigating strange goings-on at a nuclear research power station within the caves of Wenley Moor. There are unexplained power drains and several staff appear to go insane. These incidents reach a crisis point when one of the power station workers is found dead. The Brigadier summons the Doctor and his Associate, Liz Shaw (Caroline John) to find the source of all these troubles. This investigation is loathed by the head of operations, Dr. Lawrence (Peter Miles), who thinks whatever problems there are (if they exist at all) are minor and the work of saboteurs. His second, Dr. Quinn (Fulton Mackay), is concerned about how close the power station comes to meltdown, but he and his aide Miss Dawson (Thomasine Heiner) are hiding secrets of their own...secrets that would reveal all. The Doctor comes down and does discover the cause of these power drains: it is a previously-unknown race, the Silurians. They had entered into a secret alliance with Quinn: in exchange for nuclear power to awaken them from hibernation they would give Quinn their advanced scientific knowledge, which he would use for his own gain/glory. The Silurians now plan to return to the surface and remove humans from the planet. The Doctor convinces their leader that he might persuade humanity to coexist with the Silurians, who would then move only into uninhabited parts of the planet with the sufficient heat to support their reptilian bodies. However, the younger Silurians want to take full charge of Earth, and begin by releasing the captured Major Baker (Norman Jones), head of Security of the center, with a virus. The Doctor is given the virus to find a cure, but this costs the Silurian leader his life; the Silurians have had a coup d'etat, killing their conciliatory leader and deciding to stop the Doctor. The virus is fast-spreading among the workers, including the Permanent Under-Secretary for the center, Masters (Geoffrey Palmer). The Silurians and UNIT battle it out to rescue The Doctor, who has been taken by the Silurians. The Silurians return to their hibernation, and The Doctor hopes to revive them slowly and integrate them into the surface. 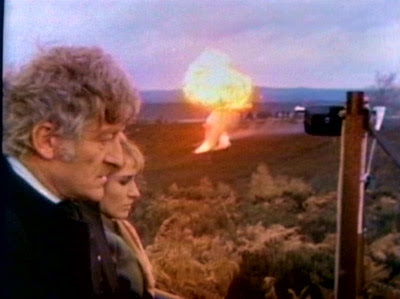 However, the Brigadier has their base destroyed, leaving The Doctor and Liz outraged and saddened. The Silurians touches on quite a few contemporary themes. There is the then-popular concept of detente, in this case the peaceful co-existence between the Soviet Union and the Western powers (the United States and Britain). There is the hope and fear of nuclear power. There even is an undercurrent of racial genocide (remembering the Silurians attempted to exterminate humans while the humans blew up the Silurian base altogether). This is all couched within the confines of a science-fiction program, so we get to delve into deep themes without losing entertainment value. It's only in the realm of fantasy where the fear of 'first strike' can be discussed without being a lecture: 'kill them before they kill us' is really the mindset of both Silurians and Humans, as is their mutual fear, hatred, and distrust. Miss Dawson says as much after Dr. Quinn is found dead: "We must destroy them before they destroy us", she screams. Though The Silurians is closer to the Cold War in its allegory, I still see only the struggle between Arab Palestinians and Jewish Palestinians, two groups that cannot appear to live in peace with each other because neither wants to give in. This unwillingness to compromise is the cause of Human and Silurian misery. Side note: in retrospect, given that the Soviet Union did collapse and that the horrors the population endured (and still endures in such places as North Korea) have since come to light, it does appear naive to think there could be peaceful coexistence between East & West. However, the fact that topics like these could be brought forward in such a smart and entertaining way is a sign of the ambitions of Doctor Who: entertainment and enlightenment. We also get greater insight into the Doctor's views. "Typical of the military mind, isn't it?" he tells Liz. "Present them with a new problem, and they start shooting at it". The Doctor is determined to bring about a peaceful solution, which is consistent with all his incarnations (right down to the current Eleventh, who attempted to bring Silurians and Humans into peaceful coexistence in the story Cold Blood Parts I & II). At his opposite is The Brigadier, though I stress to point out he isn't a villain. He isn't this 'shoot first don't ask questions' type. His top priority is to protect those in the center (and his men), and the Silurians have killed military and civilian alike, and they had released a virus that killed many people and threatened all humanity. In his mind, removing the threat of the Silurians was the only way to ensure the safety and survival of the humans. It also isn't fully established whether the bombing of their base is of his own initiative or orders from his superiors. Finally, there is no guarantee that if awoken the Silurians would have been as peaceful as the Doctor had hoped. There was still a chance that they would have decided to launch a full invasion of the surface. That being the case, one shouldn't be too harsh on The Brigadier. 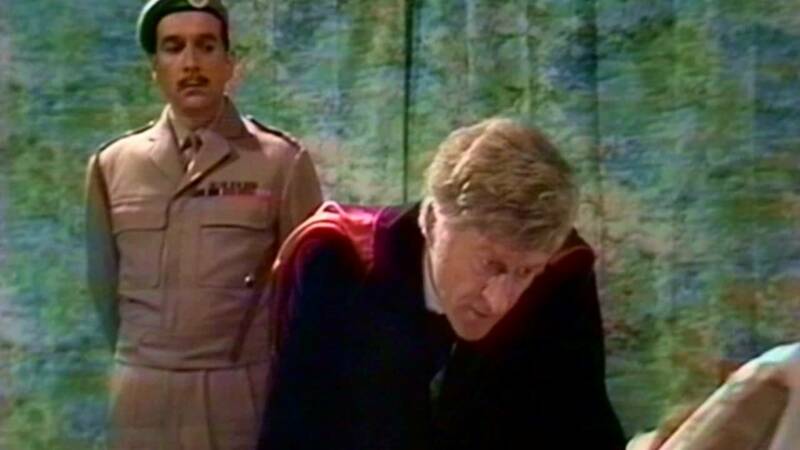 However, it was a wise decision to bring The Doctor and The Brigadier into conflict. A relationship that lasted as long as theirs, there was bound to be inevitable conflict, which didn't remove the affection and regard they had toward each other. Timothy Combe created a strong sense of suspense in The Silurians. He held off revealing the monsters until the end of Episode 3, almost halfway into the story. He would give us the POV of the Silurians, but for those first episodes, he would tease us with nothing other than people's reactions or at the most a hand. The fact that there was a lot of location work also added a sense of epic to The Silurians. He also got wonderful performances out of all his cast, especially the guest stars. Miles' Dr. Lawrence is the quintessential bureaucrat: unimaginative, removed, more interested in the success of his project than in the safety of those underneath him. The fact that his constant push to have UNIT and The Doctor removed from 'his' facility makes you hate him is a sign of an excellent performance. Same goes for the opportunistic Dr. Quinn. Mackay at first appears to be a good guy, worried about how the center keeps coming closer and closer to killing people. 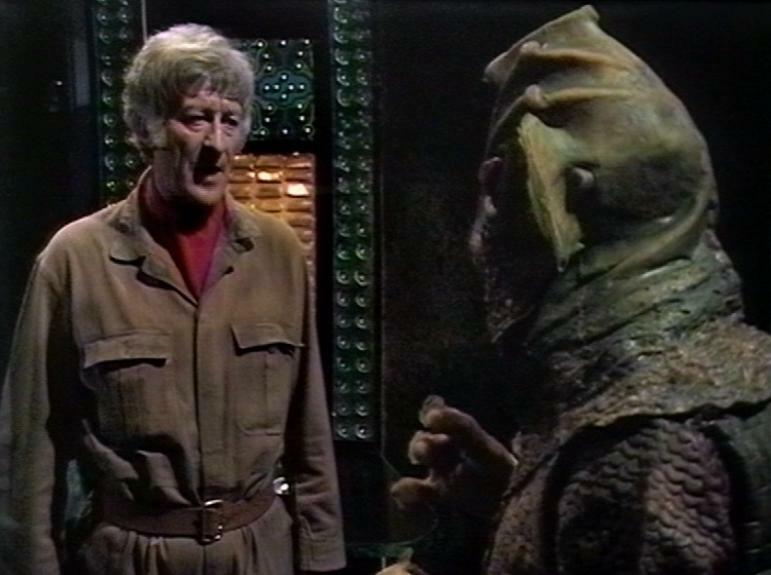 However, as The Silurians progresses, you see that he is actually a villain, who will keep an injured Silurian hostage as a bargaining chip to gain more knowledge. Mackay makes his transformation natural, never giving away his plans until the right moment. 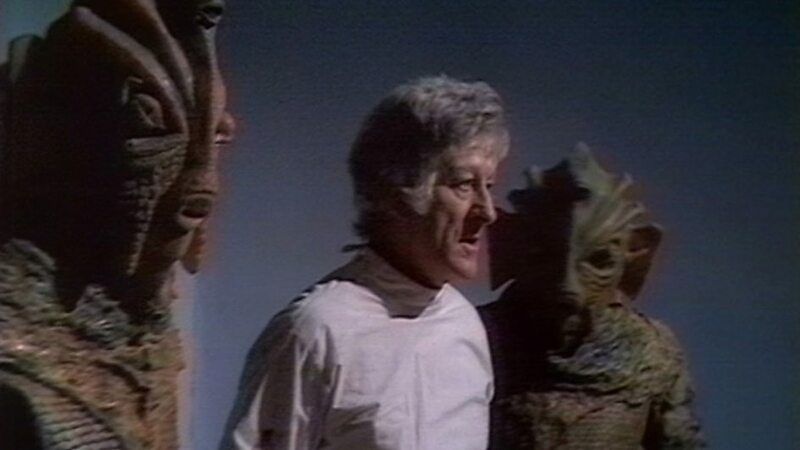 Special mention should go to Peter Halliday, who provided all the Silurian voices. Not once did the Old Silurian, his assassin, or his henchman, appear to have the same voice. His voices for at least three characters were brilliant. The regular crew were also wonderful. Pertwee's Doctor is a man of action, but also one of deep thought. He never tires of struggling to get both sides to see things his way, and his failures to do so don't discourage him from continuing throughout The Silurians. Balancing him is Courtney's Lethbridge-Stewart. He isn't straying too far from the stiff military man with little sense of humor, but he has a strong authority and an incredible ability to play everything straight. John, unfortunately, was relegated to the sidelines because of her gender, but the fact that she recognized this made her performance all the better. She is openly contemptuous of the Brigadier for insisting that, although she is a trained scientist, she be relegated to trivial, almost secretarial work. Still, it was at times hard to take her seriously when she wears such short skirts. This, I take to be a reflection of the times, when women were slowly coming into their own. The success of future Companion Sarah Jane Smith was laid by Liz Shaw. Yet I digress. There are other elements to the success of The Silurians. Hulke created wonderful monsters in that they did not come from without but from within. 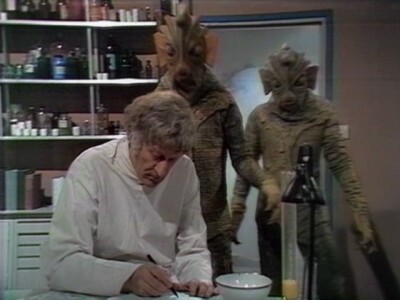 The actual look of the Silurians is a great success: yes, they were rubber monsters, but they still manage to work because of that powerful third eye that does almost everything for them, from debiliate their enemies to open their doors. Carey Blyton's score is also quite memorable, though still controversial. I can see why: when The Doctor is taken captive by the Silurians, the music they come in with is both menacing and oddly, cheery. 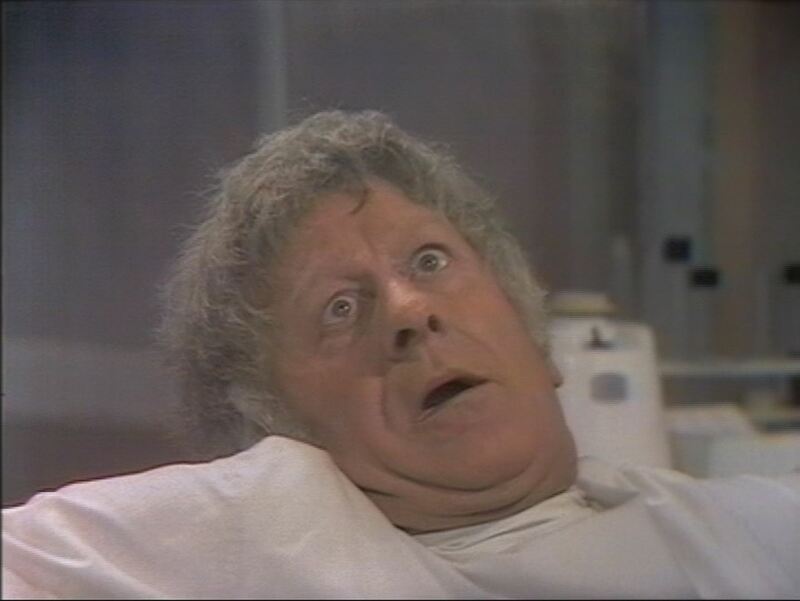 In fact, that whole scene is unintentionally funny: the music, the Silurians head-shaking while using their third eye to weaken the Doctor, Pertwee's face when being brought down. In both the closing of Episode Six and the reprise in Episode Seven, I was overcome with laughter. Granted, it is an iconic moment, but it's also terribly funny. The music is one of the things that pushes The Silurians down a bit. It really depends on your mood: sometimes it can brilliant, sometimes it can be maddening. Another is length: I've never been a fan of long stories, and this one at seven episodes did try my patience at times. Finally, the special effects with the dinosaur (who was almost secondary) just didn't work. The dinosaur (and I'm figuring it was a dinosaur living inside these caves) just didn't look convincing once. We also have that little business of the actual term 'Silurian'. Technically, it isn't correct: there couldn't have been life forms that complex in the Silurian Age. Picky, picky, picky, says I. It's a good title (although yes, he isn't actually called Doctor Who, again, picky, picky, picky). Besides, that's how they are known, let's not lose sleep on these rather small points of logic. The ambiguity of the ending to The Silurians is the final touch to what makes this a strong Doctor Who story. Was it the right thing to do? That decision was already made, and it's up to each individual to come to his/her conclusions. The fact that it touches on such current issues while still entertaining us with a fantastic story makes The Silurians a good, strong story, especially given that this was the Third Doctor's second story. It doesn't matter if it's Homo Sapien or Homo Reptilia: both can be monsters.